Coaches attached is the entry info for the first every co-ed xc relay meet at CMW. I have put the 2006 schedule on the site. Try and avoid scheduling conflicts if you can. I have posted the scrimmage meet results. Excellent work today. Please, Please, Please try and replenish the fluids that were lost today. The bus will leave school at 7:15 am. Please be at school by 7:10 am. I-95 South to I-695 West to I-83 North, Take Padonia Rd exit, and head east. Dulaney high school is on Padonia Rd. 255 East Padonia Rd. I also need a parent volunteer to take our massive tent to the meet if possible. I have posted all of the results. Please let me know if there are any errors. It got really confusing in the open/jv races. Excellent job in the rain today. Great job in the rain today. For the boys B results please double check your finish places. I may have messed some up. Nice job today. The times reflect alot of hard work. Great job today at Bel Air High School. Coach Izzo and I were very impressed with the way all who ran handled themselves. Great job today. We have to keep working hard and stay focus on our goals and good things will happen. Excellent job today. Conditions were a little warm, but everyone did an excellent job and gave a great effort. Excellent work today. Improvement continues. Great job today. Results are attached. Great job today. 2 weeks until the big one. Both teams qualified for the 2006 Md State XC championships next weekend at Hereford High School. Nice work today and another good season is in the books. Great job today. I will bring last season's scrimmage meet results to practice on Wednesday. Congratulations to the boys team for their win today. Great job to everyone today. It was very hot. Remember our biggest goal is not to beat ourselves!!! Becca Mayo and Jamie Sokolis I need your places so I can retrieve your times. Click on the headline to see full results. Or you can download our team results. Mr. Wheeler does an awesome job taking photos at our meets. Click on the headline to go to his site, and view the pictures. Great job everyone. By far our best effort so far this season. Keep up the hard work. Great job today. It was a little warmer than normal, but still the improvement from the scrimmage meet was amazing. Keep up the hard work. Great job, and a very competitive meet. We are very close to where we need to be at this point in the season. A great time was had by all. Without a doubt one of our best team efforts at North East. Great job out there, we are very close to where we need to be at this point. We still have some things to work on, but this was a very good day. Great job today in the time trial!! Excellent job today. Some great improvements were shown. Handout: Great job at Time Trial today!!!!! Click on the headline to go to the team photo site. Thanks again to Mr. Wheeler. Great job at Meade. Remember this was a full 5km. Some great times were put up today. We still have work to do, but we are getting better each time out. Attached are the results from the 07 xc divisional meet. Congratulations to both the boys and girls for winning the 2007 UCBAC XC Championships. Also congratulations to Sara Bailey for winning her 3rd UCBAC title. Congrats to all. We are still looking really good for next weekend. Attached are the results from the 11/2 time trial. Great job everyone. Congrats to Sara Bailey and Shannon Rafferty for being named to the Running Maryland All State Teams. Sara was named to the second team and Shannon to the third. A total of 5 CMW XC runners earned some type of All-Metro honors from the Baltimore Sun. Congrats to all. Great job out there today. It was very hot, and the course was a little wet. Times were good. Remember split squad next week. We had a very tough week this week. It is ok for your legs to feel a little tired. Great job today. Some great improvements from last week. In our first big meet of the season the girls took home a solid 3rd place at William and Mary. The girls were lead by Shannon Rafferty, Erica Scripa, Whitney Hora, Hannah McKenzie, and Alanna Sweetser. The boys also had a great meet and were lead by Alex Kammerer, Dan Colopietro, Scott Wheeler, Luke Burke, and Mike Fischer. It was a great trip, and well worth going down to VA. BULL RUN is next week. Click on the headline for full results!!! Great job today. One month till states, alot of work to be done, but today was a great day for CMW. Great job yesterday. Izzo and I were very pleased with the effort and attitude yesterday. Congratulations to all for a great effort today. 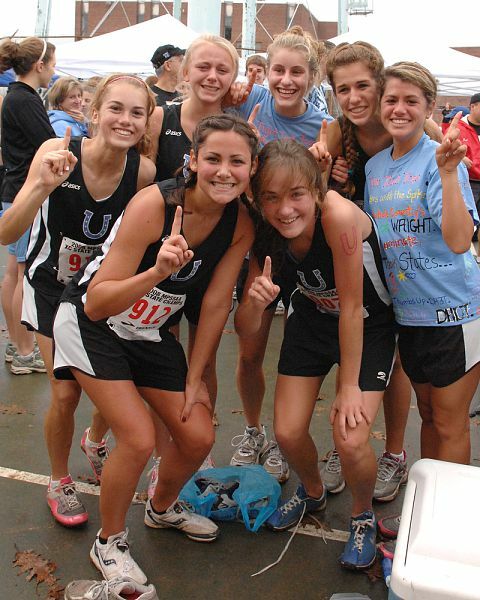 The girls have won every UCBAC championship since the league started. I have attached our results, and if you click on the headline you can view full results. Both the boys and girls team qualified for the state championships next weekend at Hereford high school. The girls won the 4a north region championships, and the boys finished 3rd. Congratulations to both teams, one week to go, and alot of work has to be done. Here are the photos of the boys and girls at the board of ed meeting. Great job today. Congratulations to all, especially the girls for winning the 2007 state championship. Great job to the boys as well for a top 5 finish. This is the best group finish we have had in 3 or 4 years. Here are the team photos we took at practice. Click on the headline to go to Mr. Wheeler's 08 photo site. Great job today. Coach Izzo and myself were very impressed with the effort that was given. The results are attached. Excellent job today. Remember this is our main starting point, and now the work begins. Coach Izzo and I saw a lot of great things today. Both the boys and girls won, but team scores will not be available till later. Our team results are attached. Great job today. It was a little warmer than normal, and everyone handled it very well. Great job for our first big meet. The boys ran an excellent race, and really packed it in to win their division at William and Mary. Not to be outdone the girls were 3rd in their division. Whitney Hora got her first big victory winning the girls race by outkicking Shannon Rafferty, a 1-2 finish was awesome. Click on the headlines for results. Congratulations to the girls for their win today at Bull Run. The boys finished 6th. Also congrats to the girls b team for an exceptional effort at the end of the day. Great job for those who ran at North Harford. Both the boys and girls teams beat North Harford. North Harford's course was much harder than anticipated. Great work. Some great performances were put up today. The hard work is paying off, and now is the time when you want to start running well. Remember late October and November are the most important times of the year. We had some great performances, and also we made some mistakes that we have to try and fix before the region meet next week. Both the boys and girls teams advanced to the state championships. The girls finished 2nd and the boys were 3rd. Good luck to both teams next Saturday at Hereford. Girls 4th and Boys 11th at State Championships!!!!! Congratulations to all on a great season, and special congratulations to Shannon Rafferty, Whitney Hora, and Luke Burke for earning all-state honors by medaling at the state meet. Great job today. We have some great starting points, and now the work will really begin. Congratulations to the girls for successfully defending their state title. It was a great day for all of you who ran. Click on the headling for full results. Excellent job on the time trial. Keep up the hard work. Parents meeting and spike night tonight at 6 pm in the cafeteria. Congratulations for an outstanding effort in today's heat. The boys opened their season with an impressive win, and the girls were not be outdone finished a close 2nd in their meet. Running Maryland was on hand to cover CMW's 2nd league meet. Running Maryland is the state website for results and info about high school running. Great job yesterday click on the headline to go to the site for results. Attached is the info for this year's William and Mary trip. Click on the headline for results. Great job everyone. One of the most competitive invites you can run in. Both groups ran really well at Aberdeen. The hard work is showing as times keep getting faster. Nice job in extremely tough conditions. The girls were 7th, and the boys 9th. Attached you will find in the info for this Saturday's Bobcat Invitational. Nice job at Patterson Mill. Keep up the hard work, and stay focused. Both teams showed some good improvement at the Bobcat Invite. Special congrats to Matt Hoerr for a top 10 finish. Click on headlines to go varsity results. CMW results on handout. Great job in the rain. Click on the headline for full results. Some great performances were done yesterday. The coaches were very happy with the effort given throughout the season. If you ran in both home meets you can compare times. The improvement is easily noticable. The boys finished 4th in their regional meet to qualify for the state meet. The girls missed qualifying by just 2 points. Sydney Steinmiller and Miriam Silton both qualified individually. It will mark the first time in almost 20 years that the girls will not run in the state meet as a team. Click on the headline for full region results. Attached you will find the 2011 xc schedule and summer training plans. Excellent job today. Remember this is our starting point, now we begin working on improving everyday. Great job today. This is the kind of effort that we need everytime we race. Both the boys and girls won, and Matt Hoerr won the boys race. Don't forget that we have practice at 9 am on Saturday at the ma and pa trail, and 9 am on Monday at school. Great job today. It was great experience racing in those conditions. I only have our results I will post team results when I get them. I believe both won. Great Job in first home meet. Great job today. The coaches saw alot of you trying to improve. We know the heat was tough. Fast times at William and Mary! Led by the girls B team's 2nd place finish, all of the teams ran very well. Everyone showed great improvement from last year. Bull Run next week!!! Attached are the line-ups for the upcoming weeks races. Great job today. You can definately see improvement. Nice effort today, but we can do better. Remember there is more to running than just doing the workouts. Attitude, Desire, and Confidence could be more important than what you actually run. Click on headline for full results. Great job today. Alot of pr's and fast times. Now we must keep up the work, and really prepare for the bigger meets. Good job today. Keep up the hard work, good things will come from it. Attached are our results only by each race. A great effort was put forth. We are now entering the big 3 meets. Time to buckle down, and for the excuses to stop. Great overall team effort. The best thing is we still have room for improvement. Attached are out team results, click on the headline for full results of the meet. Nice job today. Now we prepare for the big race. O'Neill, and Hoerr earn all state as girls finish 6th, and guys 12th at the state meet. Great job, and a great season. We are definatley on the road back to a championship team. Special congrats to Kelley, Miriam, Kaitlin, Taylor, Dan F, and Matt for earning all county, and Kelley and Matt for earning all-state. Click on the headline to view the Mustang Invite course. Click on headline to see photos of all of the all county xc athletes. After both teams qualified for States, a total of 10 athletes were named all county. Some fast times on a really fast course. Some very fast times to end the year for some. Girls B was 2nd and Boys B was first. Nice job on a difficult day. The rain can be a huge distraction. Click on the headline to go to our results website. All results are posted. Great job this weekend. We still have room for improvement, but great effort on Saturday. Great effort today. Very impressed with the effort alot of personal best were run today. Two things continued: both teams winning, and the hot weather. There is room for a lot of improvement, just keep working hard. Click on the headline to go to the result site. Great job today. Now the work begins. Great effort today in very tough conditions. Most ran faster than last year, even with a more difficult course, and much hotter day. Now the real work begins. Remember to run on Saturday. Great job today, very tough conditions.